CENTREVILLE, Mich. — Viking RV has a history of building practical and rugged camping trailers. It will expand on that reputation this year with its re-engineered Grand Haven travel trailer line, which now features aluminum-framed, vacuum bonded, laminated sidewalls. The standard smooth fiberglass exterior gives Grand Haven a higher end look than traditional ribbed aluminum skin construction, yet Viking has maintained prices competitive with other entry-level trailers. Grand Haven's MSRP starts around $15,000. Aircraft-grade tubular aluminum framing is used throughout the sidewalls, instead of wood framing. Aluminum framing is stronger, lighter and won’t retain moisture like wood. The fiberglass exterior skin is more appealing than traditional ribbed aluminum siding, and the smooth surface is easier to clean. Just hose it down and wipe it off. The fiberglass exterior skin is not vulnerable to dents like ribbed aluminum skin. Grand Haven uses a vacuum-bond bag process that provides consistent pressure over the entire wall for 30 minutes or longer to ensure a solid bond. Viking also has increased the number of floor plans it offers to seven, ranging in length from 26 feet 7 inches to 33 feet 3 inches. "This straightforward, yet broad offering allows Grand Haven to appeal to a wide range of customer needs and budgets without confusing them with too many floor plan choices," said Jeffrey Koch, national sales manager for Viking RV. "This approach also makes it easier for our dealers to have the right models in stock, and with our new advanced construction, we can give folks a premium-level product at a value price. Viking has always been about giving our customers the most value for their dollar, and the Grand Haven is no different." 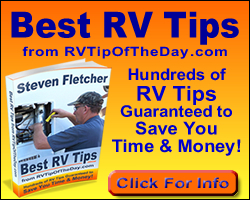 Storage is always an issue with RVs. Viking has maximized the exterior and interior storage on the Grand Haven. Most models have pass-through exterior storage, making getting at all the camping gear a lot easier. Inside, the attractive Spicy Oak cabinetry maximizes storage possibilities. There's also more storage under the lift up queen bed on most models. The fully equipped galley sports all the amenities of home — a three-burner range with oven, a double door refrigerator and a microwave oven. The extra wide dinette booth with pedestal table is standard equipment. On the entertainment side, most models of Grand Haven come with a Dolby® Digital 5.1 surround sound system with DVD/CD player. An LCD television is available as an option. Grand Haven is very family friendly. Several of the floor plans have bunk beds for the kids. The queen beds in the master suite have an innerspring mattress with designer down comforter and pillows. The optional Sleep Easy package upgrades to a pillow top mattress in the master suite, and for guests, the sofa features an air mattress hide-a-bed with built-in 12-volt pump. 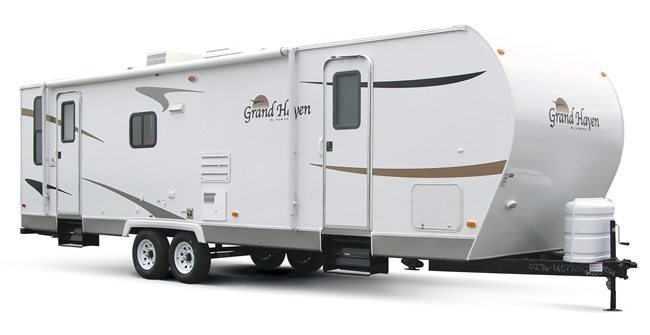 Grand Haven, with its laminated sidewalls and homelike interior, offers the looks and personality of an expensive trailer but at a very affordable price.